I had two 40% off coupons for Michael's this week, so I decided to go out there and find something for the kids. 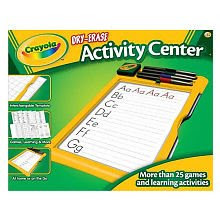 I was pleased to find this Crayola Dry Erase Activity Center. It was $14.99, but I got it for about $9 with my coupon. Unlike most dry erase activities, this one actually erases! I was so excited that I did not have to use water and a paper towel to clean the slippery little sheets. The sheets fit inside a plastic board type box. The kids put the sheets inside the box and then write on the clear plastic part. The eraser wipes the marker right off with little effort. This activity board will provide hours of entertainment and learning for my kids. It will make a great addition to the things we carry into church for their quiet entertainment. The Crayola website also has some free printables that you can use inside the dry erase board. That looks really cool. I am always looking for things like that to do with Little Bear. I might have to save up and get that one to keep as a Rainy Day surprise! Neato! I'll have to look for these. These weren't washable dry-erase markers by any chance, were they? I've been trying to find some of those for a while now....no luck yet. great idea. I will look for one too. I am trying to come up with more ways for my son to practice his pre-writing skills. Thank you for sharing this information. I just purchased this last night for our 5yo daughter for christmas and I was looking for some customer reviews. I thought if the reviews aren't good I will take it back and get her something different. Last year we made such a mistake without checking reviews and christmas was a bummer for me because many of the gifts weren't worth what I paid. SO thank you again for this feedback and for sharing the printables.